You are here: Home / Investing / How much diversification is too much diversification? 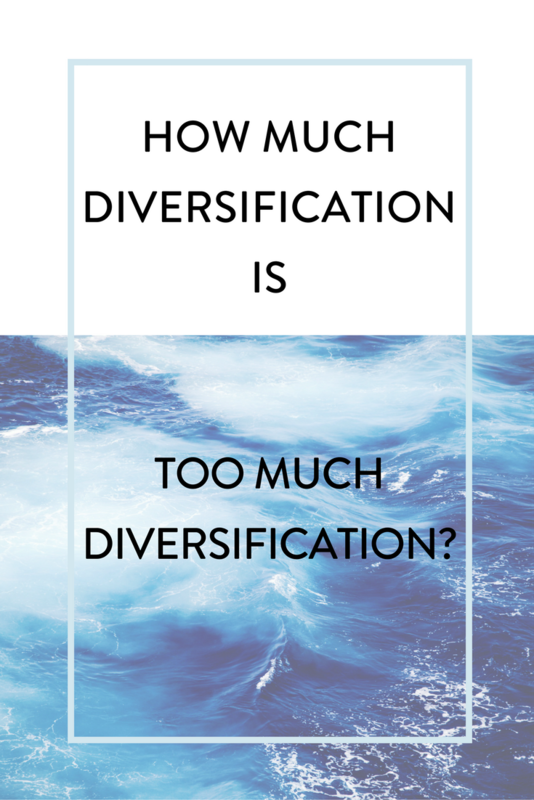 How much diversification is too much diversification? We have all heard financial investors preach on the importance of having a diversified portfolio. Not only does this maximize our profit, but it also protects us from risk by having more than one type of stock. Diversification is important to our success in the investment world. However, how much diversification is too much? How many stocks do you need to own before you are adequately diversified and is there a magical number? There comes a point where your portfolio can become over-diversified. It is important to find and maintain a healthy balance of diversity. Diversification occurs when investors intentionally own stocks in different companies, industries and geographic locations. They are intentional about this in order to reduce their risks within the market. If one industry or location struggles, there is still balance and growth overall in their stocks and investments. They are protected. This is important because the investor will have a healthier and more profitable experience. When one stock struggles, the others may thrive. This will help protect them from major drops in the market. If you have ever heard the saying, “Don’t put all your eggs in one basket,” then you will have a better understanding of this theory. The investor is choosing to have more than one basket, so that if one gets dropped, he doesn’t lose all of his profits. He is choosing not to depend on one stock or company for all of his success. However, sometimes too much diversification can hurt you rather than help. According to the Modern Portfolio Theory, or MPT, your portfolio achieves maximum diversity when your purchase your 20th stock. The MPT found, after strenuous research, that you can only eliminate your risk so much before it begins to plateau. This plateau typically occurs after your stocks add up to the sum of twenty. However, remember that the number 20 is not magical on its own. Owning twenty stocks will not automatically give your optimal diversity and maximum profit alone. Instead, your 20 stocks must be diverse and well-chosen. They should come from different locations, industries and sectors. Twenty stocks from the same company will not give you the diversity that you are aiming for. Although mutual funds can be safe and profitable, they will not necessarily give you optimal diversification. Although the fund may invest in many different companies, many funds are still sector specific. Although you may be diversified in a particular sector, you do not have diversification across the board when it comes to different industries. If you are looking for something more diverse across the board, look into owning a balanced fund. They own stocks across the entire market. When owning a mutual fund, it also can be a dangerous way to fall into over-diversification. Many large mutual funds own hundreds of different stocks, and therefore, so do you. Be sure to research what your mutual fund owns and keep tabs on how diverse it is. Diversification is vital, but only to a certain extent. Be smart and vigilant when deciding where to invest your money. Find the happy balance that you are looking for.